We recognize that preparation and practice is the key to success. We begin preparing our students for graduation early. We want them to feel confident and comfortable when it counts. 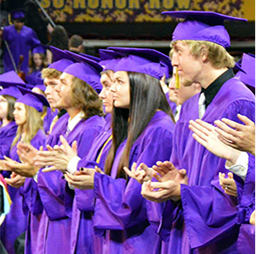 Our graduation ceremony is for seniors and early graduating juniors who have met state and district requirements for graduation from high school. Be sure to review the information on this page and please reach out to our counseling office if you have any questions. For caps and gowns, please visit the Jostens website. For senior pictures, please contact Lou Coopey at (480) 830.5667. Senior pictures need to be done by September 28, to ensure that they will make it in the yearbook.